We never know the last page of the story; how things will end. In this sense, it makes it all the more exciting to begin. When we talk about creative art, the idea of how it may end or even its goal, it’s an unknown entity, and perhaps even a futile discussion. As many of you know, Dolls 4 Tibet moved premises at the end of 2013 and in an earlier blog we talked about how the workshop would also be used as an open space for creative art. 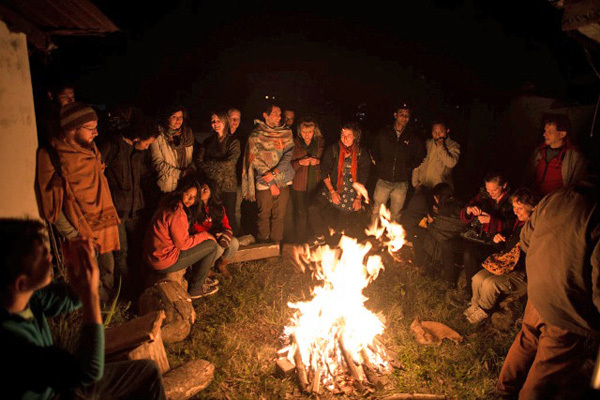 One of the main events that the workshop has been used for is Tibetan Arts Fusion and in this blog I’d like to share with you just a snippet of how it has unfolded so far, and what it is. “The concept happened by accident” said Buchung D. Sonam, a well-know and respected Tibetan writer/poet and participant in Tibetan Arts Fusion. It began when Tenzin Tsundue (writer, poet and activist) was invited to read excerpts from his poetry at an event in Delhi. He personally felt that if he brought along some other artists to perform with him it would not only make a bigger impact, but would also be more entertaining. And so Tibetan Arts Fusion was born. He took along Buchung, Karma Sichoe (painter of Thangka and contemporary Tibetan visual Art), Min Nangzey (a folk singer) and Gen Choenden-la (Tibetan flute and Dramnyen player). 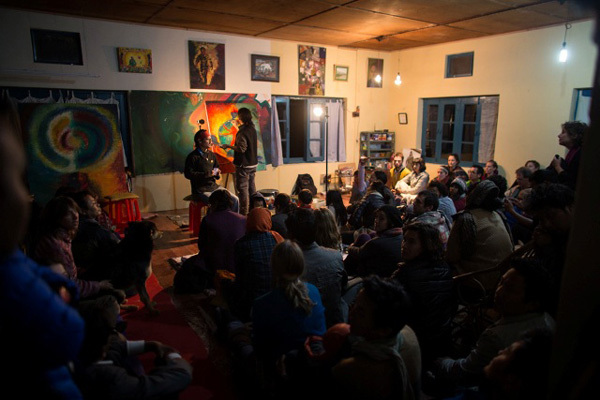 This ‘pilot’ event in Delhi sparked something inside the artists to investigate further what this fusion of arts could be, and of course to facilitate more occasions where painters, musicians and writers could come together. According to Karma Sichoe, Tibetan Arts Fusion can be likened to a “jam session with (mainly Tibetan) musicians, painters, writers and dancers”. “It was and is an experiment of spontaneous work” he said. Buchung also described the concept as “an experiment”. So, normally when we are conducting an experiment we are trying to discover something. What exactly would that be in this case? “We are trying to capture the energy and consciousness, especially of the artists – their burden, their longing. We try to capture the moment and express it” explained Karma. When asked about what they are trying to achieve with Tibetan Arts Fusion, the answer was clear: nothing in particular is to be achieved. “Creative art should serve itself” and what is happening is merely an expression of what is there in that room, at the time. Into the wee hours of the night! To date, there have been eight Tibetan Arts Fusion events, each a diverse and new experience for all involved; a true expression of contemporary (and traditional) Tibetan arts. So, having come this far, how do the artists envisage their ‘experiment’ developing? Buchung sees perhaps the emergence of themes as one possible avenue. He told me that each event could take on a theme (‘longing’ for example) and each artist should express what is inside him/her in a reactionary way based around this theme. Karma’s view is to have a greater importance placed on dialogue between the artists. He feels the word ‘performance’ is too artificial and that it should simply be ‘art’. He mentioned that the last Tibetan Arts Fusion event ran on into the early hours of the next morning and that the artists achieved a “proper dialogue”. It is clear that the artists wish the events to be a real ‘coming together’ of artistic expression, and absolutely above all, spontaneous. An audience is always present at the Tibetan Arts Fusion events. The question I had in my head was ‘what role does the audience play and what should they take away with them?’ because thus far, the artists have described it as a jam session or spontaneous dialogue between artists. The answer to this question is that the audience should come to share the moment, feel the energy and experience the creative expression. 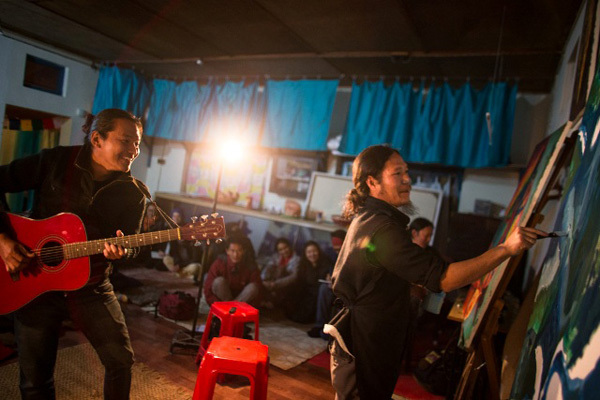 The artists are attempting to tell the story of the present, their stories as Tibetan people; human stories. 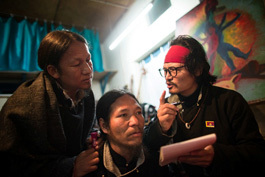 If the audience has anything to take away, it would be an understanding of Tibet or Tibetans based on the artistic expression they have seen, which undoubtedly would be a different picture to what they have seen in the mainstream media. Jyotsna, having been an audience member, agreed with this: she explained that it allows us a very close look at “completely free expression of Tibetan identity – untainted by the regular stains of community and politics, and the experience of Arts Fusion gives a crucial nuance to their experience of Tibetan exile. Because there is no one standard story of Tibet. 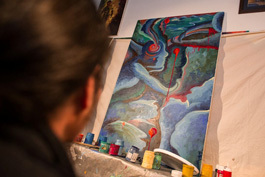 Every Tibetan’s story comprises the story of Tibet.” Tibetan Arts Fusion is a unique portrayal of a Tibetan moment in time. If you would like to follow, support or keep up to date with the Tibetan Arts Fusion events, please check out the website in progress artsfusionperformance.wordpress.com for more information.